We have a minimum limit of 15 items or $35 worth, in order to participate, unless you have furniture or baby equipment. As always, we encourage you to bring your best items so that you sell a high percentage of your things. A consignor who brings 75 great items will do better than a consignor who brings 100 items that are poor quality and marked too high. There is NO limit to the TOTAL number of items you can bring. Option 2 - Let us print them for you free of charge. You'll pick them up early (early in the week prior to the sale) and label your items at home. Then bring your already labeled items on CHECK IN Days. You will need to sign a Release of Guarantee form. Option 3 - Print your barcode labels at home using a COLOR PRINTER. Follow the directions CAREFULLY that appear after you enter your items. Label your items at home. Bring your labeled items on CHECK IN Days. You will need to sign a Release of Guarantee form. Your items are NOT guaranteed with this option! Can I bring children to the PreSale? We love your children, but we know you will enjoy your night more if you don't have them with you. We strongly suggest that you NOT bring your children to the PreSale as there might be lines and will surely be a lot of shoppers. Just bring a tape measure and their measurements and enjoy a mom's night out! We suggest you set the price at 30% of the retail value. Baby Equipment, Furniture and Large Indoor/Outdoor Toys usually sell for more than the 30%, and are in high demand. *We have an abundance of 0-6 month sizes, so they must be priced competitively in order to sell. **Maternity and Junior clothing are not shopped as heavily, so price these competitively, also. No... Please reuse your number from previous sales (this helps us tremendously during our sorting process). If you can't remember it, there is a place on the "enter items" page where it can be requested. If you have any problems, just email us at karen@rhealana.com and we'll be glad to send it to you. No. Use childrens plastic hangers for sizes 10 and below. Use larger plastic hangers for sizes 12 and above. No wire hangers, please! We've NEVER seen an item of clothing that would stay on a wire hanger without an abundance of safety pins! Clothing looks nicer and doesn't smash as easily on plastic too. 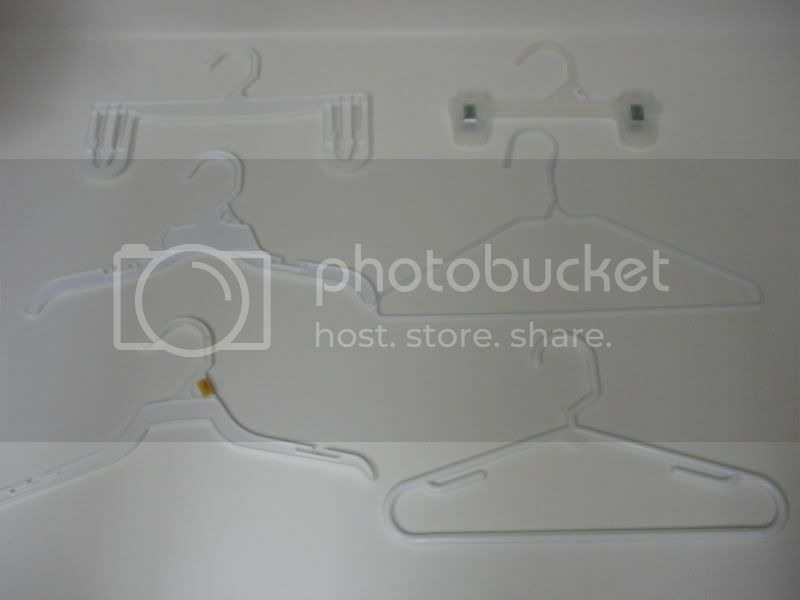 You can collect hangers from purchased clothing during the year, or you can also purchase them for around $1-$2 for 6-10 plastic hangers from the dollar store or Wal-Mart. examples of hangers accepted HERE they do not all need to be the same color. Place them in a ziploc bag and then seal the bag with clear packing tape. This is important! We suggest you bring a laundry basket or tote, or a large shopping bag. We may have some bags or baskets available for use, but are on a first come first serve basis. Wrinkled clothes do not sell! Presentation is very important, please do what is necessary to make your clothes look clean and nice. Remember, the better they look, the better they sell! Yes, you may enter additional batches until 11:59 PM the day before the LAST CHECK IN day. See the SALE INFO for specifics. Yes. Most of the furniture displayed in the Furniture Nook is sold in the first two days of the sale. Contact us about bringing larger furniture items and read more about what items are not accepted (dishes, accessories and lamps, etc.) before listing furniture for the sale. We have lots of sponsorship opportunities at affordable prices for those of you who want to reach your target market - moms with families. Another possibility is a website sponsorship. Contact us for complete information.